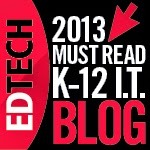 As educators, we constantly reinforce the skills of media literacy with our learners. This includes traditional types of media, but as more advertising moves online, it’s important to transition beyond the usual print ads, television commercials, and radio announcements. Today's learner needs to be savvy about new media. Traditional advertising is direct; we see, hear, or read it. Other than tapping our senses, it does not take advantage of our privacy. Digital advertising is subliminal and unseen. It secretly gathers data to aggregate and push ads to the devices our students use. It is the invisible web behind the banner, ad, or game that they don’t see that matters. The visualization developed by CM Summit and The Office of Creative Research called Behind the Banner provides an interactive view of how the adtech ecosystem collects data based on search patterns. 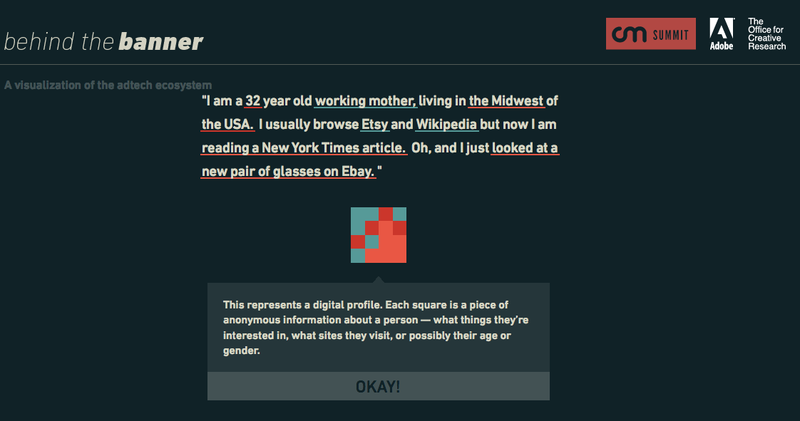 It is a fascinating look at the how a digital profile forms based on a piece of anonymous information about a person. The visualization unveils how computers compile a complex network of data to deliver ads tailored to a user's interest and what websites he or she visited. The sheer amount of data can even be customized to target age or gender, and it all takes place in a nanosecond. Most people do not fully understand just how much our privacy is tracked every time we search or share information over digital networks. For this reason, we keep an open dialog going with our learners. We try to thread connections throughout the curricula areas by revisiting, reinforcing, and reviewing new resources to help them visualize what happens online, particularly regarding privacy. As technologies continue to change, so do the privacy settings. Unless users remain vigilant in checking updates, or reading the fine print of acceptance policies, their privacy can be easily compromised. We want our students to know our approach is not to be a cop looking to block access. Unlike many of their parents who are not so tech savvy, we know that our students are far more skilled at getting on the web even with parental restrictions. Instead, our objective is to keep the line of communication open about issues of privacy, opportunities lost over poor judgment, and techniques used to track personal information online. To help younger children understand digital ads, we recommend the video, What Does The Ad Say?, from the Internet Advertising Bureau in the UK. This short, educational video is perfect for helping children and parents know how online marketing works and the types of digital markteting techniques used to target users. An initiative that began in Brazil has now gone global, thanks to the creative way it inspires empathy for children facing battles with cancer. Hair loss due to chemotherapy can be particularly difficult for students who now must endure the stares of strangers and the questions of classmates. 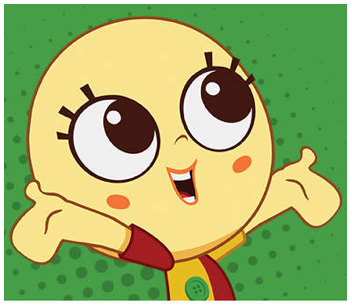 In response, cartoon characters are "going bald" to show affinity and kinship with these courageous children. This month, artists of some of the most popular cartoons around the world are drawing their leading figures with no hair or with a head covering. The surprise by readers is meant to mimic the same expressions of wonder that childhood cancer patients confront everyday. NPR and other outlets have reported on this Bald Cartoons venture, launched by ad firm Ogilvy Brazil and cancer nonprofit GRAACC. 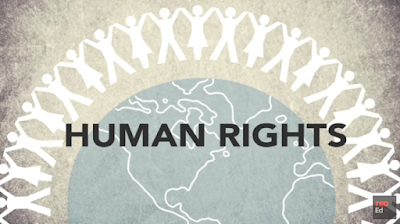 These images are particularly powerful to show in the classroom. They raise thoughtful topics of medicine and science, but even more, they generate authentic conversations about the bravery of young people with cancer. This dialogue fits neatly into a year-long curriculum about stereotypes, appearances, and perceptions. The drawings also reveal the power of visual imagery. They point to the influence of media, especially in graphic novels and pop culture. The ability for a cartoon to make a difference speaks volumes about the prominence of pictures in today's society. That message alone is an important one to discuss with students. Social media users can download icons to temporarily replace their profile pictures to show solidarity with the cause. For teachers who may have students diagnosed with cancer, there are a lot of good resources available to figure out how best to support children during their long and painful journeys. Especially important is making students feel welcomed upon returning to school and making them feel like their classmates still see them as "themselves." Finally, the BBC recently reported on a clever new online game that teaches children about their cancer. Developed by HopeLab, the game is called "Re-Mission2," and the six interactives play like real video games, based in the terminology and enemy cells of cancer. Check out the video below for more information. If you're like us, you indulged during this past week of spring vacation with some welcome sun and possibly some holiday candy. If you're also like us, you're now returning to a classroom full of restless students who can see the end of the school year in sight. Luckily, the animation wizards at NBC News have once again offered up a timely treat to engage students' eyes (and taste buds) on their first morning back from break. The motion graphic, "The Business Behind Chocolate Easter Eggs," offers a surprisingly rich educational tour in just under a minute and a half. The video is not even really about Easter, so it is worthy of showing to any diverse classroom. 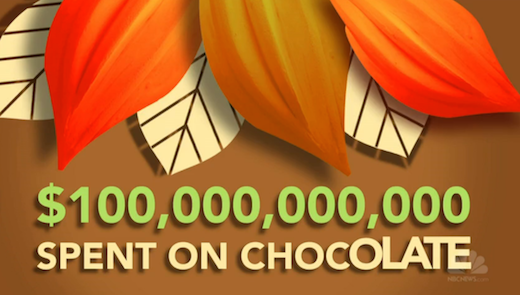 Instead, the clip is a visually gripping survey of the worldwide chocolate business. The narration touches on a wide range of useful learning points. It teaches mathematics and financial literacy in exploring the percentage growth of chocolate sales and the economics of futures markets. It pinpoints geography and global trade in highlighting the sources of cacoa beans. It touches on the devastating effects of human slavery in mentioning the ethics of forced labor. And, finally, it offers insight into media literacy and marketing in showing the spike in seasonal bunny rabbit advertising. For another way to incorporate the Easter holiday into the classroom, check out "Everyone Loves Peeps, Easter Infographics & More." Tax day is rapidly approaching. April also happens to be Financial Literacy Month. It makes sense, therefore, to tap into the annual angst of April 15 to teach students about the nuances of the federal budget and the impact of income tax dollars. 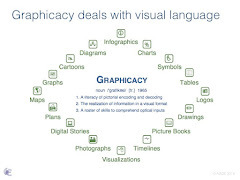 Aside from offering relevant windows into the priorities of the national government, the visualizations and motion graphics below also provide keen tools to practice mathematical analysis and the graphic charting of data. 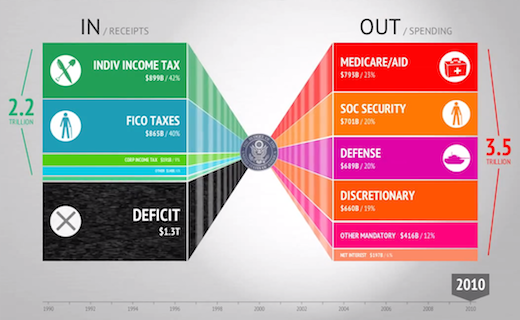 The video (above) from Visual Budget lays out a clean presentation of federal dollars, tracing the allocations of taxes coming into the national coffers and then being assigned to specific programs. Funded by a Kickstarter campaign in 2011, Visual Budget aims to make "complex, dense data engaging, exciting and interactive." The sophisticated animation depicts a helpful breakout of taxes paid by each percentage group along the earning spectrum. To personalize the tax-paying process, a clever interaction called "Every Day Is Tax Day" allows users to enter their own salary information to see exactly where their withholdings end up. 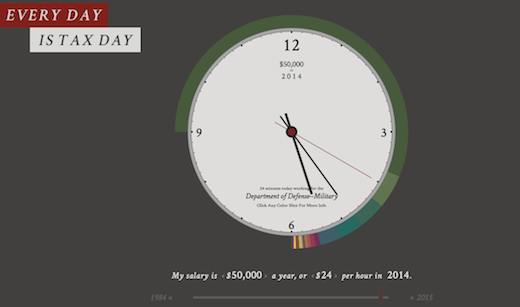 An award winner in the 2011 Data Viz Challenge, this site from Fred Chasen invites students to click on any colored slice in the data ring to see how funds are spent via government work hours. An honorable mention in the Data Viz Challenge that students will appreciate is "Can I Get A Receipt With That." 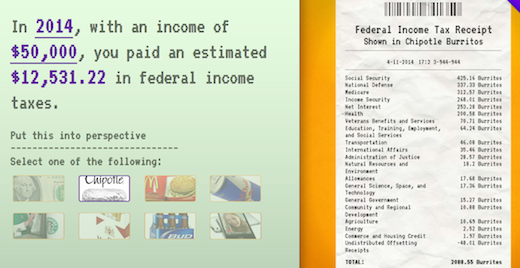 This seemingly simple site from Adam Albrecht and Kevin Mack permits users to input personal earnings to get a printed "receipt" of which federal departments use their tax dollars. The fun is in clicking on the relevant comparisons, such as in seeing how many Chipotle burritos are "spent" on national defense. Finally, all of these resources are a far cry from the 1954 cartoon (above) produced by the United States government that attempted to make citizens feel better about paying their taxes. In classic retro style and gravelly narration, the clip walks students through the complexities of the national budget. For more ideas about teaching with taxes, check out "The 1040 Form Turns 100: Resources To Explain Income Taxes." In today’s world of fast-paced touch screens, snaps, clicks, and tweets, we increasingly find it difficult to get our learners to see that design and presentation matter. We are not sure if this is the result of the over-scheduled child jumping from one activity to another, or the increasingly shorter attention span to stay with something to make it their absolute best. Now more than ever before, content and design matter in tackling a problem, iterating an idea, building a prototype, or constructing a presentation. 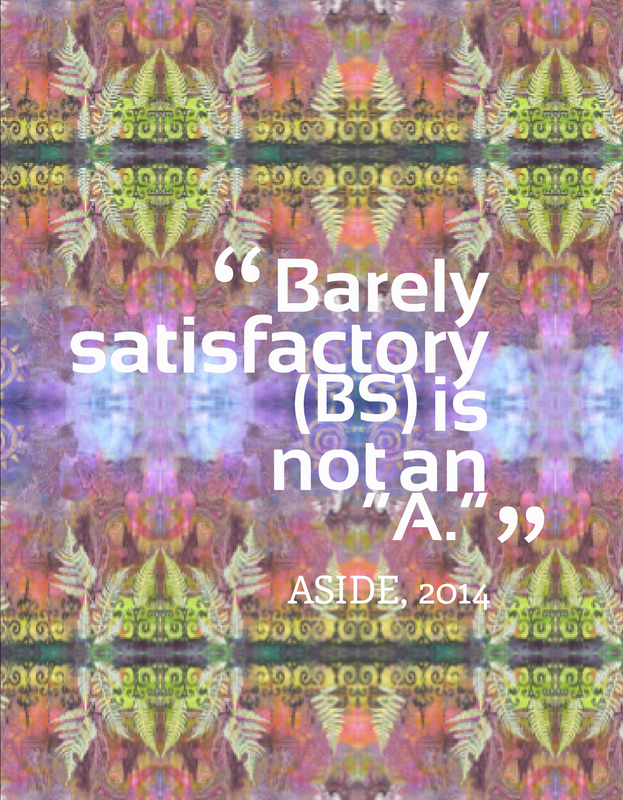 What is clear is that many of our learners think it’s just fine the way it is. When they are assessed on their work with a clear outline of the expectations based on instruction and modeling, they often fail to meet those expectations. 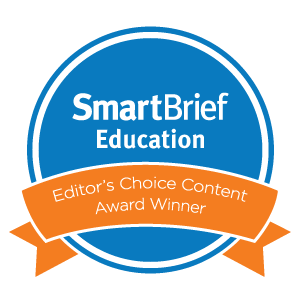 As educators, our delivery of content is evaluated on presentation of material, integration of technology, engaging activities, and differentiated instruction. Yet, it seems our students think that delivering text-heavy presentations spinning out of control in Prezi, shallow research to demonstrate understanding, or shoddy work put together in haste is okay. Design does matter, and it is not good enough to think what is created cannot be improved upon through iteration. The key to good design, however, is content. We are beginning to feel a little dictatorial about it, too. We often see students busily changing fonts, picking colors, and adding pictures before crafting the content into an organized, well thought out way. On the opposite side, we see students putting work together without using any of the evidence they’ve gathered in their research. We provide the time for deeper learning, choice in delivery method, and integration of technology. 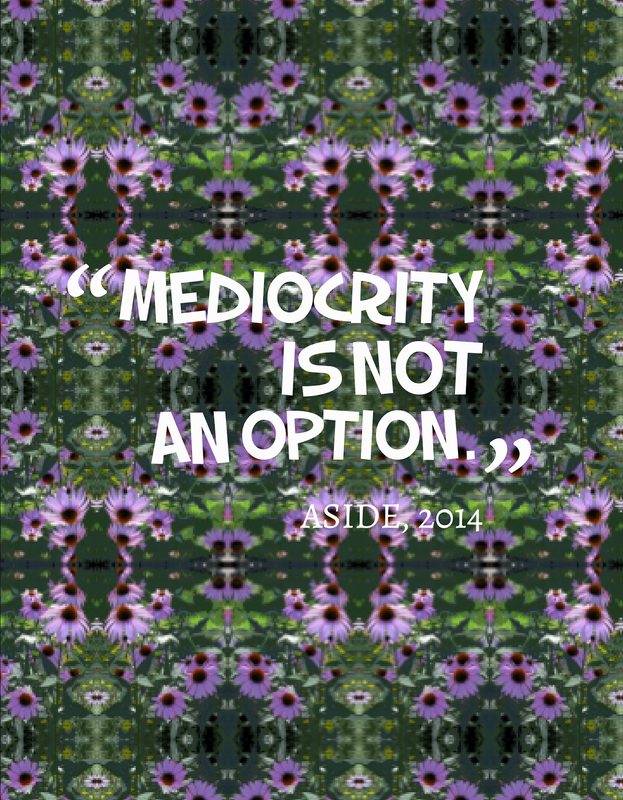 Sadly, we still see mediocrity. How many times have we heard “I’m done” two minutes into an activity, only to realize that they left out key requirements because of a failure to read instructions? While we don’t mind doing something over to make it better, there’s a certain responsibility in not getting a “do over, and over” as a result of sheer carelessness. We’re sure that many have heard the expression “failure is not an option;” well, what about “mediocrity is not an option?” The problem is not a matter of flipping, blending, empowering, engaging, or any other buzzword; it’s a constant push for sustainable, deep thinking on the part of our learners. They need to know that it is not fine to be run-of-the-mill. 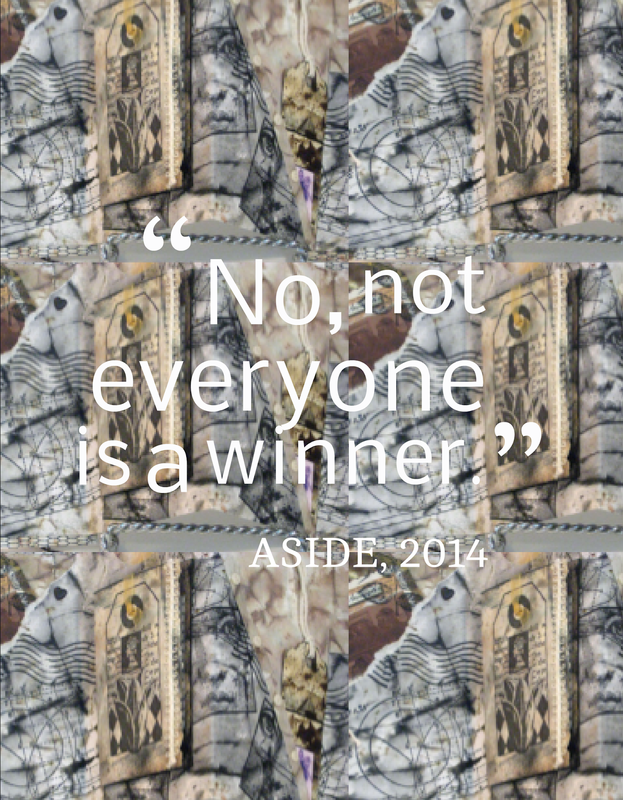 The “everyone is a winner” mentality drives mediocrity, and learning that is a “mile wide and inch deep” leads to pedestrian thinking. We’re not giving up; we want the kids to sink their teeth into things. So we will keep pushing them beyond mediocrity, because the “ah hah” moment becomes a life-long curiosity for wanting to know more.